There’s such sadness in that word. I remember the day I realized our life was about to change, in a BIG way. I dreamed of all the miracles that were ahead and felt indescribable joy! I was filled with excitement, already in love with our baby. Heart broken, I realized that my dreams were lost. Helpless, my world came crashing down. My babies left before I had a chance to hold them in my arms. My husband and I have had five miscarriages. Its such a lonely experience and in my pain I kept quiet as many do by the common thought to not reveal your pregnancy until you’ve safely past the first trimester. It’s a commonly known fact that one in four pregnancies ends with miscarriage, usually before three months, this allows a woman to keep her secret. While there are many cultures who honor the baby who passes before birth, some carry out rituals, others have baby-naming ceremonies, sadly our culture does nothing. This just adds to the emotional and psychological grief that a woman experiences. Strangely, it makes sense, if you tell no one of your pregnancy then there’s no one to know of your heartache. I felt so much shame in having to give an answer. It was easier to keep silent and hide in grief and loneliness. None of these emotions can help heal. There is no joy in the depths of this pain. After years of holding on to so much shame, I finally realized I was no longer going to live like this. By no fault of my own did I lose my babies, I was finally ready to make peace with my loss. Miscarriage does not define me. I am so much more than that. I became aware of who I had allowed myself to become and consciously made the decision to allow my heart to heal. My morning rituals of meditation, journaling and energy healing created space inside my heart for those raw emotions to rise to the surface. I began to feel a deep sense of healing and with the support of a dear friend who was able to ask the questions that I’ve been longing for someone to ask, she helped me to express my feelings in a new way, with this came blissful, soulful peace. I will never forget my little ones; they will always have a special place in my heart. Bless you Kasia, thank you for your friendship,love and support! What were the questions that you needed people to ask ? You are a beautiful Mother. Sometimes there is a loss and an ache that happens within us that is beyond words. My daughter in law and son lost their baby when she was 8 months pregnant a few years ago. It is wonderful that you have your friend who asked you those questions, and for the allowing of all that is there to be in that sacred space of pain and loss. It is a sacred space, for love holds all of it, until it can move a little into some new space, where there is a bit more space. 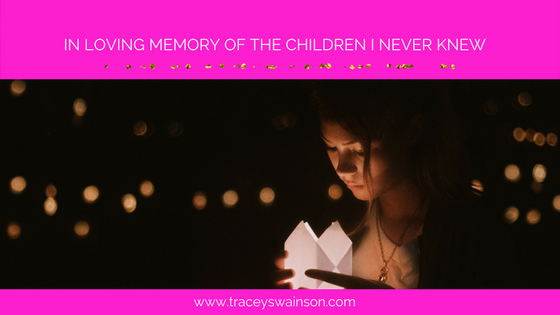 What I know is that my daughter in law, my son and their children allowed themselves to go through the stages and feelings of what was there, over and over and over feeling the rawness of it fully. It took courage to be with it over and over through the layers experiencing the fullness of each of those layers. It has been their teaching. Their pain and loss of their dear daughter has formed them in new ways and continues to do so. That love is always with them, forever etched in the fabric of their Being. With love to you Tracey for the gift of your sharing and for the love that you are in who you are. Eileen, thank you for sharing your family’s story. It takes so much courage to face the pain and then to embrace the healing. I cannot imagine the heartbreak that they faced having lost their baby at 8 months pregnant. My heart goes out to them and may they continue to find healing as the years go by. I send my love and prayers to them. Thank you, I appreciate your kindness. Here you’ll find a sprinkle of compassion, a dollop of grace and a whole lot of heart to help you heal your heart and find peace after pregnancy loss.